Classical texts, such as the writings of the Roman orator and statesman Cicero (106-43 BC), were relatively rare in 12th-century monastic libraries, but were eagerly collected as models of elegant Latin. This manuscript of a collection of Cicero's works has the remains of an ownership inscription of a church dedicated to St. Mary in a place beginning with 'B'. It also has a series of ghost stories added into blank spaces, which relate to Byland and the surrounding area: the book must therefore have belonged to the Cistercian abbey of St. Mary's, Byland. The brown inscription in the top margin of this page reads 'Liber sce. 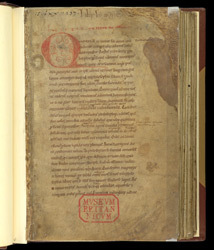 Marie de B[...]' (St. Mary of B[...]'s book).